Since the climbing wall opened at BSU, climbers of all ages have found a place to learn skills, find climbing partners, and strengthen their muscles. 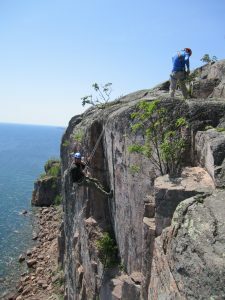 The indoor wall has also created more demand for outdoor trips to such destinations as The Needles, Red Rocks, Joshua Tree and Devil’s Lake. Our regular trips explore the North Shore or lovely Ennis Lake near Ely. 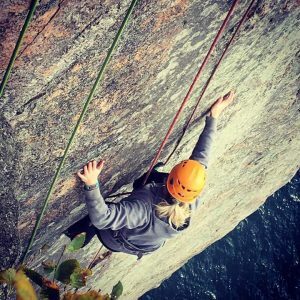 These trips are all suitable for beginners as well as the serious climber, because each destination has routes of all levels of difficulty and our instructors can find appropriate goals for everyone. OPC instructors place a premium on teaching skills that will make you a capable and safe climber. Harnesses, helmets and climbing shoes are provided, though you are welcome to bring your own gear to use. Instructors will test belay skills to ensure that safe practices are used at all times, both at the wall and on trips. Watch for clinics such as lead climbing, anchors or multiple pitch workshops. Request a time to work on these skills with an instructor.